Contrast Dracula with The Mummy and the tone changes. Mark Cousins celebrates Dracula and Frankenstein as the two films that shaped Hollywood genre filmmaking – and The Mummy appears to primarily repeat the success of Frankenstein by casting Boris Karloff as the unnatural monster in the world. Karloff, iconic and unforgettable, continues to play a large, imposing, gaunt and deeply unsettling monster. Make-up (by Jack Pierce) is impressive as Karloff emerges as ‘The Mummy’ in the opening sequence and – in the final moments – breaks down into a bag of bones on the floor. The Mummy was hugely successful and is considered a “photographers film”, celebrating the director Karl Freund – a director who had working with Browning on Dracula and Fritz Lang on Metropolis. The Mummy is the first version of the deceased Egyptian whereby he is brought back to life and, crucially, seeks to find his loved one in the modern world (A mummy had been brought back to life in a silent film in 1911). 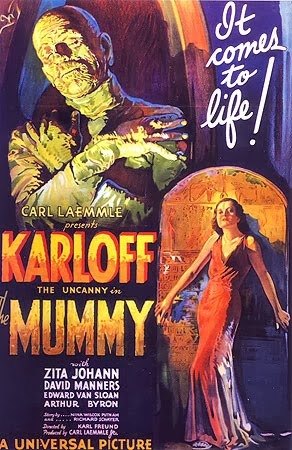 The film begins in 1921, whereby ‘The Mummy’ is raised. Ten years later under the name Ardath Bey, The Mummy advises the expedition to search in a specific location to find the remains of his lost love. In an attempt at raising her from the dead, he requires an Egyptian woman’s body. The Egyptologists and archaeologists (actors from Dracula include David Manners and Edward Van Sloan) realise that Ardath Bey is, in fact, Imhotep, but it is too late as Imhotep kills and controls mortal’s minds as he inches closer to reviving his princess. Clear parallels can be created between the two films. They both arrive to an alien location (Modern day in The Mummy; London for Dracula) and kill others for the love of a woman they intend to make their own – mummifying and vampiricising (?) respectively. Considering this, it is strange to imagine how 1999’s The Mummy, starring Brendan Fraser and Rachel Weisz, is a remake of this horror classic. While The Mummy was turned into a successful million-dollar, CGI-laden blockbuster, Dracula remains amongst the spooky horror sub-genre movies. Unlike The Mummy, Dracula cannot be reinterpreted easily. Dracula has so many iconic, defined elements that cannot be adjusted or erased ensuring that the 1931 original holds its lofty place in the horror canon. The long, static moments as the camera waits silently, observing Bela Lugosi or Boris Karloff is a testament to the skill and power of silence – a type of filmmaking that these filmmakers and actors were more than accustomed to. Modern horror is grim and gruesome; explicit and shocking. As Dracula leans into bite his victims, Browning cuts to the next scene. We could learn from these masters of horror. So, it is only apt that we watch these films again – in darkened rooms, with the lights down low, as the crazed laughs of madmen echo down the halls. The old footage, and marks on the film reel, only support the spookiness of these Classic Horror films.